One of the benefits of getting older is being able to see how God works in His time. I was reminded of this on a distant trip in July which Rena and I made to Northeast Brazil where we worked in the eighties and nineties. At that time there seemed to be so little fruit in proportion to the time and money that was invested and in the seed that was sown. 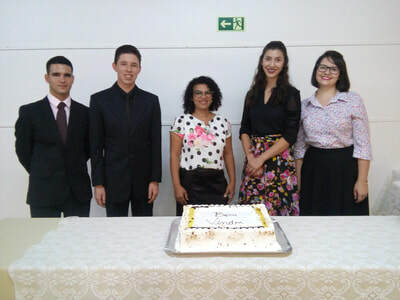 One older lady in the town of Santana de Mangueira told me, “I was very hard back then, but you first brought the gospel here and later I became a believer.” Her daughter also became a baptized believer about 25 years after she began attending our services back in the eighties. 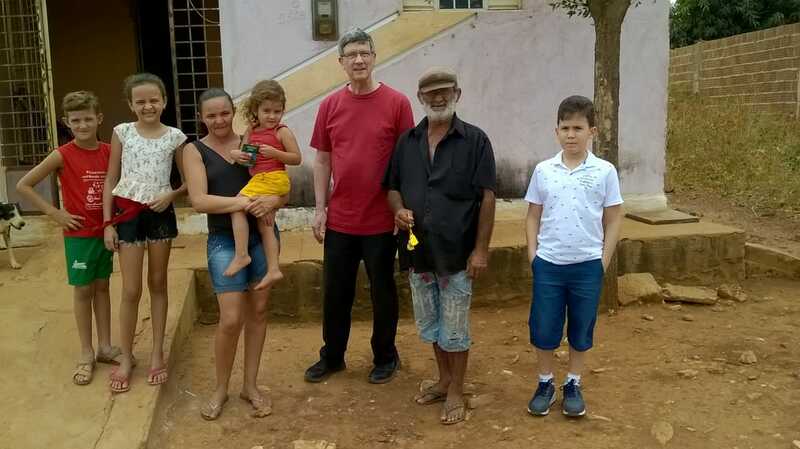 Pastor Paulo and the church have developed their own outreach ministries through the years in Santana, including camp and a weekly radio program. The Apostle Paul said, “I have planted, Apollos watered; but God gave the increase” (I Cor.3:5). May God be praised Who uses whom He will in the way He designs to save souls and edify His church in the world for His glory. 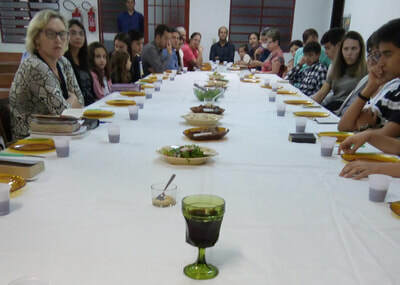 It was also encouraging in the city of Patos to see children of the second and third-generations in church from some of those who were in our youth group back in the eighties. Benedito, a son in the faith from 1983, provided us with transportation for several hundred miles as we visited believers and old friends in four different towns. One old friend was John Baptist, affectionately known by our children as “John Beard” a brick mason who helped us significantly in the construction of two church buildings in the eighties. I asked John about the Bible I gave him years ago, but he said he had left it with his first wife and he no longer had a Bible. John, at 63 years old, now has a second family and young children who are being raised without a Bible or any Bible instruction. I have since sent a Bible and a children’s Bible story book for Benedito to deliver to John. May God grant that one day this seed will also sprout into new life! This month we have resumed our normal ministries at the Bible College and at our church. Pr Flavio and his wife are adjusting well after their arrival in April and hopefully will be able to assume pastoral leadership at the church within a few months. Our services have been blessed with a good number of visitors recently and the spirit among us is sweet, but we still look for a harvest of souls. We intend to keep preaching, sowing the seed and trusting the Word that says that both he that soweth and he that reapeth may rejoice together in the fruit that is gathered unto life eternal ( John 4:36). Thank you so much for your part towards making our ministry possible here. It’s hard to believe that almost 1/3 of the “New Year” is behind us already. Beyond our normal church activities since the beginning of the year we had a week of fasting and prayer, men’s distribution of 200 calendars in neighborhood evangelistic outreach and a presentation of the Old Testament Passover meal followed by partaking of the Lord’s Supper on Good Friday. We were encouraged with the increase of four new members: two by transfer, one by reconciliation and one by baptism. Also, a seven-year-old girl professed to receive Christ in Sunday School. Two of the church’s young men are developing in the area of preaching and teaching and most of our 43 members are involved in some specific work in the church as together we seek to be “always abounding in the work of the Lord” [I Cor. 15:58]. 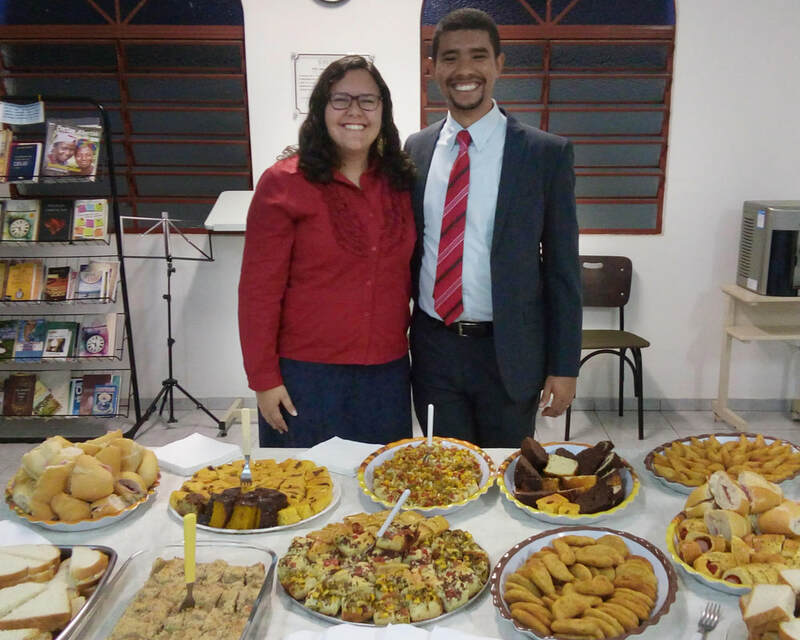 Flavio and his wife Isabela moved into the church’s parsonage on April 3 to begin his ministry as co-pastor. The church is pleased to have a resident pastor for the first time in over five years. Rena and I look forward to transition out of the pastoral leadership as we work with this dedicated, young couple throughout the rest of the year. Our Bible College ministry resumed on March 5 as classes reconvened with 21 students. With student enrollment down the school’s financial resources are also down, but we are privileged to continue having a small part in the ministerial training of some of Brazil’s finest young people. Rena teaches English and manages the school’s store. I teach three subjects, direct the Christian Service department and serve as the school’s treasurer. All of the people and things mentioned above need your prayers. At 66 I thought we would see a reduction in our activities this year. However, beyond the increased responsibilities in both ministries which I’ve already mentioned, I was recently elected by our South Region missionary colleagues to serve as president for a year. Sometimes it’s like, “What are we doing? Where’d everybody go? I’m their leader!” Well, we’re here to serve and to fulfill the Great Commission. At present, we have no definite plans for retirement, but will continue in Brazil until the Lord leads otherwise. Let me give you a rundown of our activities from July to October. Thank you for your gifts and prayers! JULY is always our “red-letter” month since our birthdays and wedding anniversary occur then. This year July was “ruby-red” as Rena and I commemorated our fortieth year of marriage. We were also able to meet with our daughter, Jonna, and her family for a week during their visit to Northeast Brazil. Our son, Micah, was there, too. In addition to this memorable time with this part of our family I was invited to preach in two churches and was able to see the new camp ministry which is being developed under Missionary Jeff Reiner’s leadership. AUGUST – Classes resumed at the Bible Institute with 41 students enrolled, 10 of which are marked for graduation in November. Rena continues to teach piano and English, records weekly Christian service reports and manages the snack-shop. I have invested significant time with legal documents as the school’s treasurer, in addition to teaching the Book of Romans and Expository Preaching. SEPTEMBER – Two churches in Brazil’s Northeast invited us for back to back anniversary conferences, so Rena and I flew off again for 12 days. 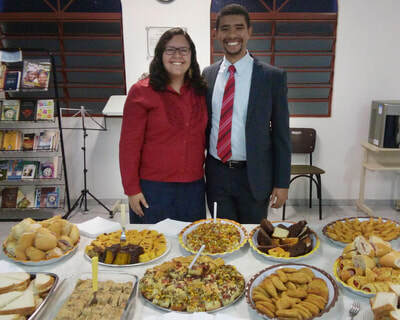 In the first conference we were encouraged to see that Pastor Alex, a 2008 graduate from the Bible Institute, was doing a fine job in a growing church. Alex baptized seven the Sunday we were there. His church had also started a new congregation not too far away. The second conference took place in Patos, Paraiba, where we lived and worked from 1983 – 1992. It was good to see the church full with some second-generation believers present and others from three sister- churches in the region. From Patos we made the hundred-mile trip to Santana de Mangueira where we started a church in 1983. The pastor’s wife was saved as a teenager during that time and we were pleased to hear that she has had a class of up to 22 boys, some of which have recently professed faith in Christ. The pastor and I were able to visit some old friends and once more we presented the gospel to Jaca and his wife, Maria, who used to host gospel services in their house. We also witnessed to Chagas who seemed to be close to salvation 20 years ago and Dorgival, the ex-mayor who donated the land on which the church stands. Pray with us that God may yet grant repentance to these who have heard the gospel many times. OCTOBER - We had a special day of prayer at our church on October 4. Among other things we are seeking God’s blessings on our revival meeting which takes place Oct. 10,11 & 12. Also, we’re praying for the spiritual stability of a few children who have recently professed faith in Christ and for others who are interested in the gospel, but are not yet saved. And of course, we, along with all of our church veterans, need renewal of our commitments to God and our passion for the lost as we anticipate the Return of the Lord Jesus. PS: We plan to be in the US the month of December for a rest, for my mother’s 90th birthday, and for time with our family.